Premier and Motorsports: A Winning Team! For over a decade Premier has followed, supported and built in the motorsports industry. 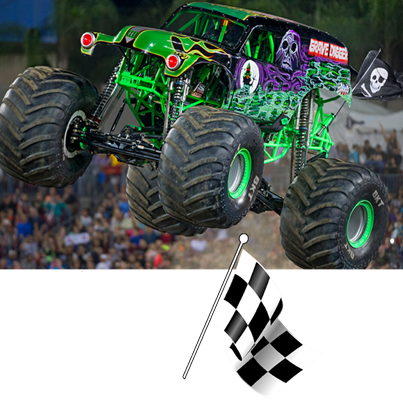 Another fan of Premier is Dennis Anderson, proud owner of the champion Grave Digger team on the Monster Jam® series. Anderson’s “Digger’s Dungeon” on North Carolina’s northern coast is a campus with several metal buildings housing shops and equipment for the Grave Digger operations. Premier sponsored Chris Dilbeck‘s #9 car in the January, 2018 Speedfest at Crisp Motorsports Park. Another recent project that we are proud of is located in Dawsonville, Georgia – home to the Georgia Racing Hall of Fame and Atlanta Motorsports Park. The Premier construction division has recently erected a 40-bay garage for Atlanta Motorsports Park, as well as three new Kart buildings for the new state-of-the-art Kart racing facility on this massive campus in northeast Georgia. All the metal garages are finished with mansard roofs and stacked-stone wainscoting to bring a cohesive finish to the entire project. Matt Walker’s MotoXCompound is a well-regarding motocross and supercross training facility in Culloden, Georgia. Retired from racing since 2006, Walker’s dedication and hard work has helped him grow his business and seen several success stories including Aaron Plessinger, riding for Monster Energy/Yamaha Factory Racing Team. With six fantastic tracks and a steel building for recreation and full-body workouts, Walker’s year-round program continues to grow and thrive competing with the top facilities in the country. Learn more about the MotoXCompound and Walker’s EcheconneeMx off-road park, just outside Macon, Georgia. Teem Motorsports, in Franklin, North Carolina operates a high-performance motorcycle and motorsports repair service from their Premier steel building. With both a retail operation and the need for garage operations, a clear-span metal building was the obvious choice. Our construction division handled the entire 4,600 square foot project from pouring the foundation to erecting the building, installing windows and doors and trimming out. Steel buildings are a great fit for motorsports! PreviousPrevious post:Waste Eliminators – Industrial FacilityNextNext post:We’ve Come a Long Way Baby!